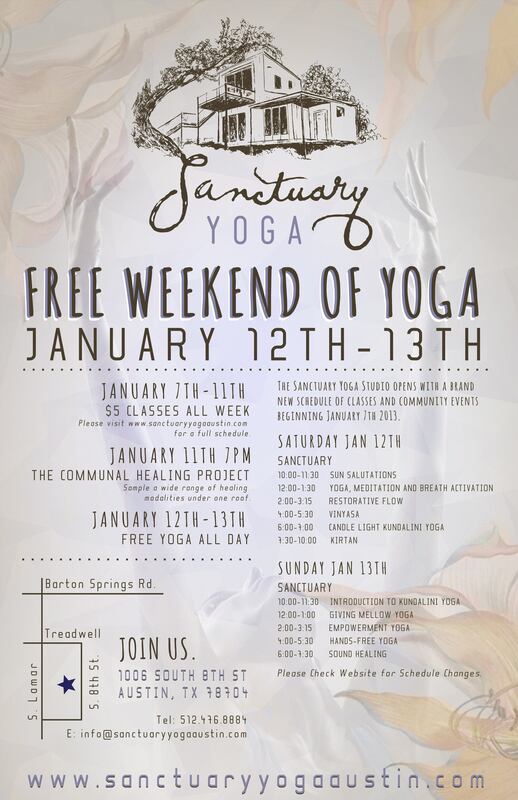 We are excited to announce, it’s official… Sanctuary Yoga Studio is now open for your practice. Our new website is live – you can check it out here. Sun Salutations, Meditation, Restorative Flow, Vinyasa, Candlight Kundalini Yoga, Kirtan, Empowerment Yoga, Hands-Free Yoga, Giving Mellow Yoga, and Sound Healing. The weekend will begin on Friday with our Communal Healing Project which offers a dozen alternative healing modalities for a donation of $20. The Communal Healing Project starts at 7pm and lasts until 10pm.